I wanted to think of a better title. Something clever. Something snappy. Maybe something a little less descriptive and a little more simple. But alas, this really is about old lakefront homes. Not regular old homes, mind you, as an old lakefront home with a 70′ lot that wants to sell for $2MM can do so. An old lakefront home anywhere on this lake can, will, and has sold. There’s a market for the old lakefront home, so long as the lot is reasonable and the setting acceptable. But not all old lakefront homes fit into our market without a time consuming, expensive, depressing effort. Allow me to explain. Pricing is everything on the lake, and if pricing finds an older home on that aforementioned 70 foot lot, the price should be in line with market expectations. Older homes on lots like this will sell for land value. Newer homes on lots like this will sell for a premium. This isn’t the sort of older lakefront home I’m talking about. Legacy estates exist on Geneva in magnificent numbers. These are the estates that get talked up on boat tours. The sort that people pause in front of on the shore path and frame in their selfies. These are the Wrigley’s and the Ryan’s and the names that no one knows but the names that sometime, some long while ago, made a fortune doing something that people valued. They took that fortune to these shores and established their lakefront space. Their retreat. Their legacy. These legacy homes traded with some regularity up until the very early 2000s. Since then, I wouldn’t describe any of the sold lakefronts with this title. 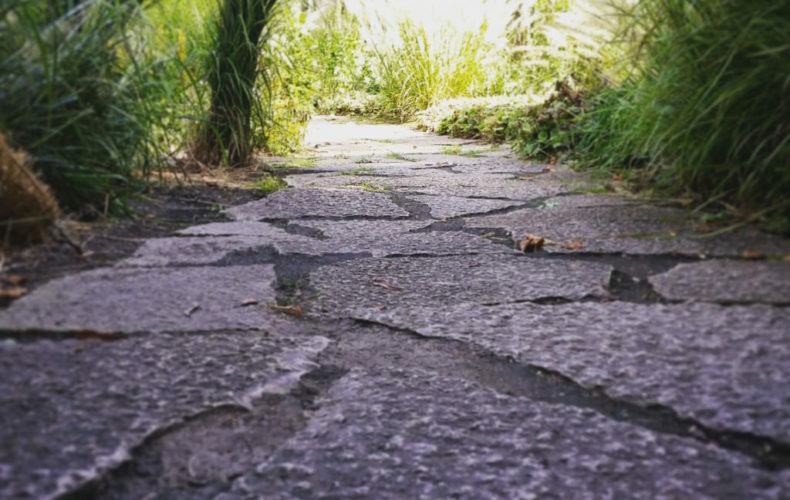 Was Hillcroft, those 19 acres along Snake Road that sold in 2018, a legacy estate? Well, maybe. The property certainly fit the description, but this is a post about old lakefront homes, not old dirt, and the home itself was no longer P.K. Wrigley’s manse, but instead a modern manse built in the 1980s. Surely no structure built within my lifetime could be adorned with this lofty descriptor. The only true legacy estate to sell in the last twenty years is Alta Vista, that Van Doren Shaw home on the North Shore that closed in the year 2000 for a paltry $3.45MM. I’d argue that we need a new legacy listing. Something on this lake that has history that even the most modern among us could not bear to tear down. The trend, in case you’ve missed it, is for Lake Geneva to loudly pay homage to history but then, once history comes to market, we just knock it down and build something shiny. I’d love to represent a true legacy estate someday soon. Everything I’ve sold on this lake is nice, but I’d like to set my aim at selling something that can be preserved and restored, rather than demolished and rebuilt. But today isn’t about the legacy estates, just as it isn’t about the 70 foot lot with an old home on it. It’s about old lakefront homes with large lots that fit somewhere in between these two stated examples. The market, while light on legacy offerings, has been historically heavy on another sort of offering. The old lakefront home on a large lot offering. The sellers know what they want. They want lots of money and they want you to see the value in their home. It was built in the 1980s, after all, or the 1970s for that matter. Maybe even the 1950s or earlier. These are the homes that aren’t new enough to substantially remodel (as would be the case with 1990s or newer construction), and they aren’t old enough to be considered architecturally meaningful. These are the in between. The large lot having, no architectural pedigree sporting, big old lakefront homes. And the market doesn’t like them. Not. One. Bit. The sellers force feed the market, saying, come look at my big old home on a reasonably large but not overly impressive lot! And the market yawns. That’s because the market either respects a home or it doesn’t, and as soon as it doesn’t, it’s land value, and land value only. The gulf between land value and a number that shows value for the structure is the issue. Sellers fight this. They scratch and they claw and they switch brokers and they beg you to appreciate their Reagan administration raised ranch. It’s big, after all, and the lot is, too. Look at me! I have two Sub-Zero refrigerators from 1981! This isn’t a new issue for our market, but it is an issue that’s presenting more frequently as prices increase and large lots because more and more rare. Expect this trend to continue, and the battle between buyers and sellers will persist. As for me, I’ll be here, stuck in the middle, wondering if those old Sub-Zeros might work better if we just get the vents vacuumed. 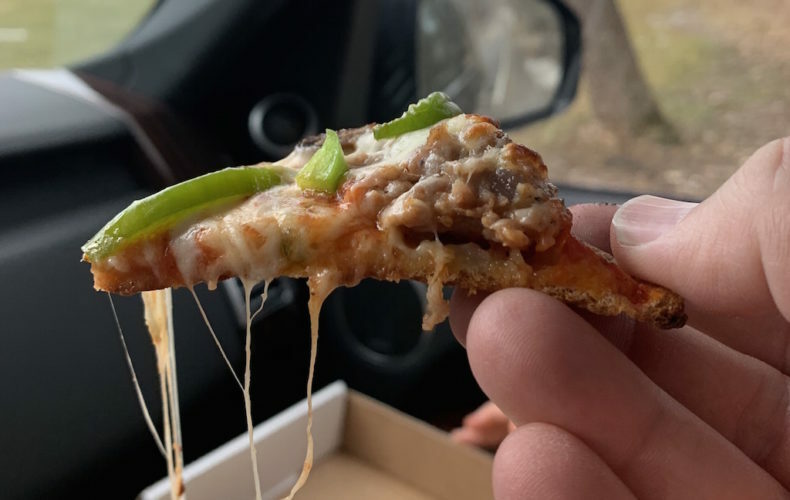 When you’re reviewing pizza in an area of rural Wisconsin that is populated, be it seasonally or annually, by people from Chicago, it’s only natural that you hear the admonitions. Why eat pizza in Lake Geneva when it’s so much better in Chicago? If I want pizza I go to Chicago. Chicago’s pizza is so much better, I can’t even stomach the local stuff. This is what they say. With those statements swimming in my mind I looked up Steve Dolinsky’s (The Hungry Hound) top pizzas in Chicago. Number one was south of my comfort zone. Number two was in Lakeview, Pat’s on Lincoln. So I did what any Wisconsinite would do, and I drove to Pat’s to taste what a pizza should taste like. I won’t dwell on this review. I ordered pizza. I ate pizza. The crust was super thin. The toppings, fine. The cheese wasn’t right. The sauce was decent. As I sat there eating the number two pizza in that second city I couldn’t help but think that Pino’s in Walworth was better. On the heels of that Chicago trip, my desire to eat bread slathered with sauce and meats and cheese had yet to be tamped, so I tucked in to a raised booth at Harpoon Willie’s Tuesday night and ordered a pizza. Harpoon’s is a favorite of mine, mostly due to their delicious brisket sandwich and waffle fries, but also due to the proximity to my office and to the lake. It’s a great bar, and nothing will change that. Not even a very disappointing fish fry last year could shake my commitment. But I’d be lying if I told you that I didn’t think about that poor review that I gave their fish, and worry that I might have to deliver another blow to one of my favorite places. It was 5:04 when we ordered. A large 16″ pizza. They have a Meat Lovers but not a supreme, so I eschewed the meatballs in favor of some green peppers and mushrooms. The remaining meat should suffice. The waitress was kind and polite, and refilled our water glasses two or more times while we waited for our pie. The restaurant was reasonably busy, but when the clock struck 5:35 I was beginning to think our pizza might not ever come. Then again, the wait at Pat’s in Chicago approached 50 minutes even though the restaurant was almost entirely empty. At 5:36, the waitress brought out our meatball-less pizza. Advantage Harpoons. This was a beautiful pizza, and since no one else said it first, I had to mumble it under my breath. The cheese was dotted with battle scars from the heat of the oven. The crust was thin, crispy, ideal. Not as thin as Pat’s, mind you, but what, at this point, does that matter? The green peppers were a bit raw, which was a bit upsetting, and the sausage was relatively heavy on the fennel seed. I like my fennel seed right next to my olives, burning in fiery hell. The sauce was good, not too sweet, not at all bitter. The underside of the pizza was a bit too chalked with flour, which is a rookie pizza maker’s sin that I’ve committed many times. It didn’t bother the pizza, but I did think it to be an area that needed some improvement. The cheese was ample but not overwhelming, and it’s the cheese on our local pizzas that sets them apart from Pat’s. I’m sure the cheese all comes out of the back of a Sysco truck, but the cheese here is just better. Saltier, denser, better. In spite of these few complaints, the pizza was superlative. It easily beats Pat’s. Easily beats every other pizza on this tour, excepting perhaps Pino’s. My son and I debated this on our drive home. On one hand, the crust here is thinner, crispier. The flop test featured not a single degree of flop. The scene here is better. The view, the style, all better. And I think on this night, the pizza was, too. And just like that, we have a new leader. In a well known, oft admired scene in The Great Outdoors, Buck Ripley is shooting pool at a local, Northwoods bar. His introduction to Cammie, a local, comes by way of an unfortunate placement of his pool cue. When the cue finds its awkward position, Cammie, the street tough Northwoods girl of John Hughes’ imagination, reacts with disgust, assuming young Buck placed it there intentionally. Later, Cammie is sitting outside the bar, puffing a heater, when she teases Buck, “you don’t know how local I am“. Why am I telling you this? Well, because until a few weeks ago I didn’t know there was a pizza place in Walworth called Nayeli’s. Some local I am. Aiming to educate my Walworth ignorance, I pulled in for an early dinner at this Walworth establishment. It was Tuesday, it was melty outside, and the restaurant was empty. But it was only 4:45 pm, so the quiet nature of this basic restaurant was understood. The interior is as the rest of them. Simple. Nothing here to remember, nothing to write down. 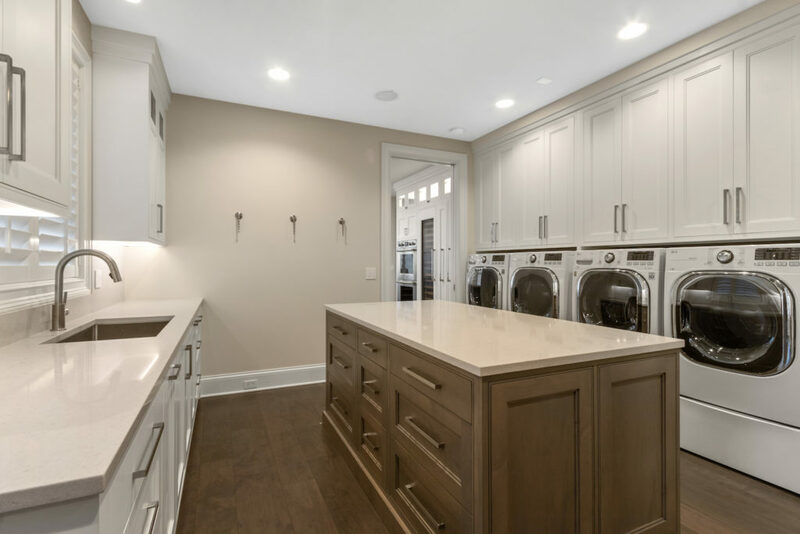 You will not find any design ideas for your next basement remodel. It’s just a restaurant in a strip mall next to a Subway and some empty storefronts. In the distance, Mecum’s headquarters occupies the old grocery store. It’s just Walworth, and Nayeli’s is just a place to get pizza or a sandwich. When a friend suggested I try Nayeli’s, the suggest came with a recommendation. Order the Double Dough pizza. There are several varieties of crust here: a thin crust tavern style, the double dough, a hand tossed pan style (somewhere in the middle of those two, I presume), and a Chicago Deep Dish. I would normally have only sampled the thin crust, but with the recommendation, I had to try the Double Dough. One large (14″) Double Dough Cheese pizza, and one large thin crust Supreme with pepperoni, bacon, sausage, green peppers, mushrooms, and onions. I told the waitress to mail the black olives to Satan. It was 4:49 pm. We sipped our waters, which my son tasted “dusty”, and waited. The restaurant smelled of cleaning solution, which I find obnoxious each and every time I encounter this restaurant flaw. Locals walked in with some frequency, picking up take out orders and driving away. Business seemed relatively brisk, and I was happy for the Nayeli’s that it appears as though they are holding their own in a town ruled by Pino’s. The waitress brought plates to the table and added that she brought us the bigger plates. Game recognizes game. At 5:07, under the 20 minute timeline that I find to be a reasonable wait for a thin crust pizza, the Supreme was brought to our table. It was beautiful. Legitimately beautiful. Ample toppings buried in and around nicely browned cheese. 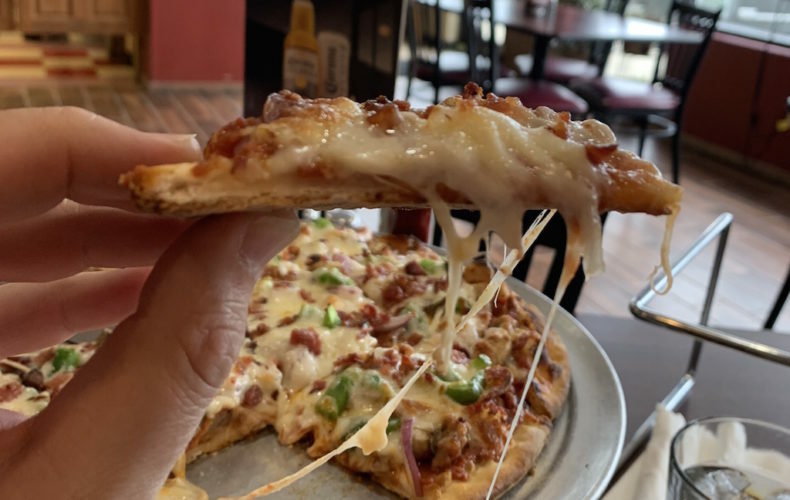 There wasn’t too much cheese, which was nice, and more in line with Mama Cimino’s than Pinos or the Next Door Pub, who both apply cheese with a snow shovel. The initial crust test was astounding. This pizza stood at attention with no droop or sag, easily becoming the sturdiest, crispiest thin crust that I’ve experienced on this tour. I was impressed. But things weren’t all perfect. The vegetables were a tad too crunchy, which wasn’t a fatal flaw, but was less than ideal. The real problem here is the sauce. It was a touch bitter. There was a heavy undertone of dried oregano. It reminded me very much of the pizza sauce at the old Chicago Pizza in Lake Geneva, the space now occupied by the Flat Iron Tap. The pizza was well constructed and well executed, but the sauce let me down. Admittedly I prefer a sweeter pizza sauce, but this sauce just wasn’t to my liking. The Double Dough pizza was brought out shortly after the Supreme. The waitress said “this is beautiful” as she admired the nicely raised and golden brown crust. The crust was brushed with some oil, or butter, and it glistened under those dining room lights. Sadly, the pizza was mostly for looks, as the crust itself was, well, doughy. There was nice oven spotting on the underside, and it had some crunch, but it was a lot of dough, and the dough was a bit gummy, and not chewy. I don’t know what I expected, since it’s literally called Double Dough, but I’ve had better doughy pizzas. My friend, who is seemingly normal and capable of discerning good pizza from bad, failed me on this particular recommendation. The pizza at Nayeli’s is good. The crust is superior. The restraint shown when applying cheese is to be commended. But the sauce wasn’t to my liking, and that is the only thing that holds this pizza back from taking the top spot on this tour. 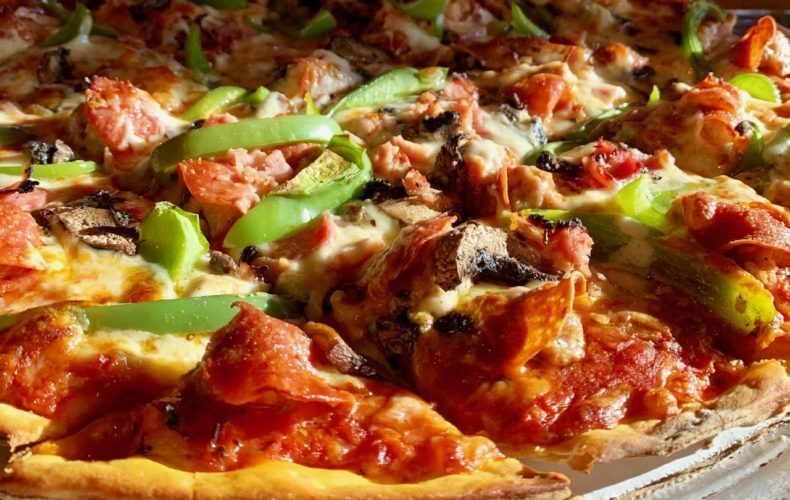 Next time you’re up at the lake and you’ve had enough of the regular pizza joints, try Nayeli’s. You just might like it, and if nothing else, you’ll feel like a local. You know, like me. There’s a thing about making Tuesday pizza night. It’s not a night where you have to contend with lines. Crowds like the weekends. But I think weekends are for rookies, and Taco Tuesday is for those who aren’t yet aware that we’ve replaced all of that with Pizza Tuesday. And if you walk into Mama Cimino’s in Lake Geneva on Tuesday you’re in luck, it’s two for one night. That’s what the waiter told me when I sat down in the dining room of this Lake Geneva pizza house. Buy one get one, cash only, he said. The cash part was an obstacle for me as my wife had pried from my cold hand the last of my Tuesday cash. I ordered, but I didn’t get the free pizza, because I had to pay with a credit card. I couldn’t help but feel as though this was an unlucky occurrence, that I was somehow deprived of my double pizza destiny. I ordered a 16″ Cimino Everything, which comes with sausage, pepperoni, bacon, Canadian bacon, peppers, onions, tomatoes, mushrooms, and olives. I told him to cast my olives into the depths of fiery hell. The restaurant was not full. If you’ve never been, it’s wedged in between the fast food row in Lake Geneva, just south of the main drag. The restaurant shares a common wall with a Verizon store. There’s nothing here out of place, but there’s nothing here that will uniquely bring you back. The tablecloths are white and red checked plastic. The tables wobble. There’s nothing else worth noting. But it was 6:06 on a Tuesday and I had already ordered. One other table had some patrons, one of whom leaned in towards me to whisper a hushed secret, the pizza is good here. At 6:10 my friend joined me for dinner, a local of sorts who told me to eat here. He sat down and we waited. I stared at the ficus in the corner and flipped through the Lake Geneva Regional News to see which real estate agents still think print advertising is a good idea. At 6:25 the pizza was brought to our table. It was big, it was hot, and it looked delicious. For the first time on our tour, the outer edge of the pizza was a bit charred, which I like. It seemed as though our next door table mates might be right. The pizza was once again tavern style, square cut, with the typical toppings under cheese routine that is common here. The cheese was thick, but not so thick that it bothered me. Both The Next Door Pub and Pino’s pile on the cheese with a heavier hand. The vegetable toppings were cut into smaller cubes, which more than once left me thinking a pale piece of tomato was actually a piece of carrot, which would have been disconcerting. The sausage was delicious and pronounced, but the rest of the meaty toppings faded into the background. Which is a good thing, because I generally find bacon to be a misplaced pizza topping. The crust here is different. 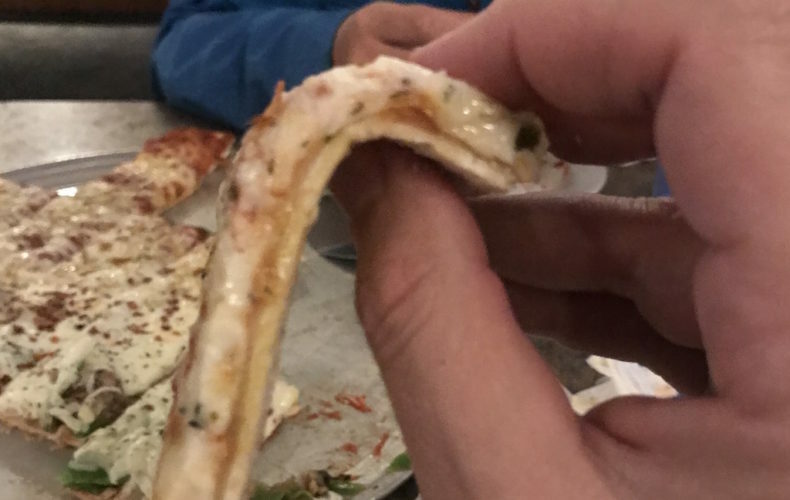 It’s thinner than any of the other pizzas on this tour. The consistency is not crunchy, instead it gives like a pie crust might. The crust behaved like it had butter in it, which I doubt it did. But still, it was thin and it was crunchy, though not like a cracker, and not with any real resistance. The first few pieces were nice, but as the pizza feast wore on, the squares failed to retain any crunch. At first it didn’t bother me, and I thought it to be a reasonable condition, but as I thought about it I found it increasingly unacceptable. The sauce was sweet, which I liked, and the waiter brought us a small dish of marinara sauce “to dip the crust”. I appreciated that, and I found the waiter to have a friendly edge that I didn’t anticipate. It was clear this man cared about this restaurant, and wanted his diners to be happy with their experience and happy with the pizza, and I was, mostly. But that crust, man, that crust. The consistency just wasn’t right for me. The soggy ending wasn’t right, either. At first I thought I liked the pie-crust type give to the crust, but thinking about it now, I prefer a crisper crust that takes a more significant chomp to work through. On this night, the pizza was pretty, pretty good. Was it the best Walworth County has to offer? No. But I think you should try it for yourself, and if it’s a Tuesday, bring cash. Certain phrases elicit certain reactions. For instance. If I tell my wife to “calm down”. The reaction is something I can predict with startling accuracy. If my son is bothering me and I tell him that he is banned from his xbox, he’ll react in the same apoplectic manner each and every time. And if I read that someone says they don’t “need a lake house”, my reaction will escalate far beyond that of my wife having been told to calm down and my son having been banned from gaming. You don’t need a lake house? Pfft. The latest round of this profanity was uttered by a well-intentioned homeowner in a recent Crain’s article. The person owns a home in a North Shore suburb of Chicago. The house is for sale. When a house is for sale, the owners grasp at straws to describe just what it is that makes their house more special than the others. Better than the others. Unique and rare, that’s what their house is. In the case of this gentleman he said that he never felt the need for a lake house, because this house, located on Lake Michigan, is his lake house. It’s a primary home and a lake house all in one, with one tax bill and one landscaping bill. It’s tremendous win. Or so he thinks. Before I blast off into a state of discontent, I must remind myself that this guy means well. He’s just trying to sell his house, and that’s something that I can understand and appreciate. But in trying to sell his house he has reinforced a myth, and it’s the myth that I find unconscionable. The myth says that a house on or near water is a lake house. A lake house is a lake house, a lake is a lake, a view is a view. In this, homes near water are all the same. Be the home near a great big lake, a tiny little lake, or this, our magnificent lake. Homes are homes, lakes are lakes, and this guy has his lake house. For terrible and irreversible shame. Yes, you could work your way up through the minor leagues and find yourself standing on the mound, about to hurl a heater in the first inning of your league championship game. You could do that. Or you could just buy a ticket in the bleachers and eat popcorn while you watch the game. In this scenario both people find themselves in the stadium on game day, under the same sun and staring at the same green, hatch-mowed grass. Why put in all that effort to be the pitcher when you can just buy a ticket and enjoy the same game? This is what it’s like to own a lake house on the big lake, on either side of the big lake. And this is the primary and most significant difference between Lake Geneva and that big lake. The big lake is beautiful. It’s nice to look at. I appreciate it for the inland ocean that it is. I look forward to one day holding the Western states ransom as they wish to stick their straws into our big lake. 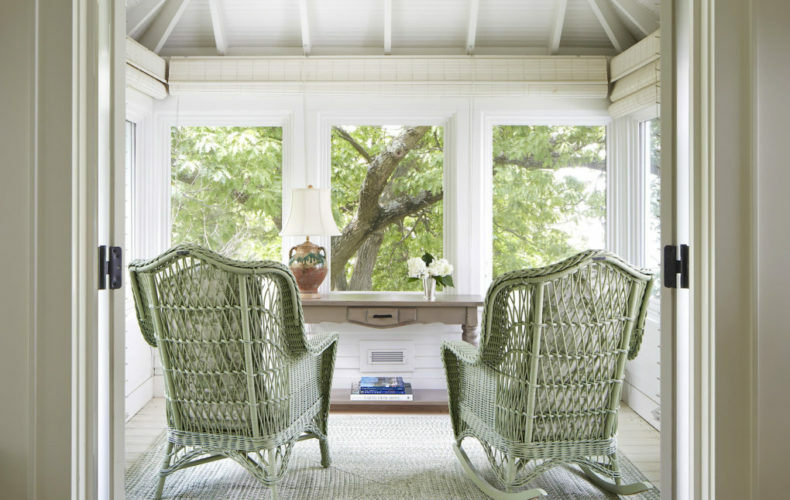 But to ascribe lake house abilities to a home on that lake is simply an error. The difference between Lake Geneva and Lake Michigan? The ability to use the lake. If you want to tie a boat in a harbor and drive home to your lake house, I suppose that’s up to you. If you’d prefer to have a lake house with a view of water and no means to use that water, that’s again, like your opinion, man. But if you’d like a lake house situated above that water where the water itself is the weekend, then that’s why you come here. If you’d like your boat waiting for you at the end of your lawn, tethered to your private, white pier, then you should be here. If you’d like to see sunrises and sunsets, this is your place. If you want to ski in the morning and swim in the afternoon and fish in the evening, all without leaving your own property, then you come here. A lake house isn’t really a lake house unless it lets you live in a way that indulges in the adjacent lake. Swim, boat, fish, ski, sail. 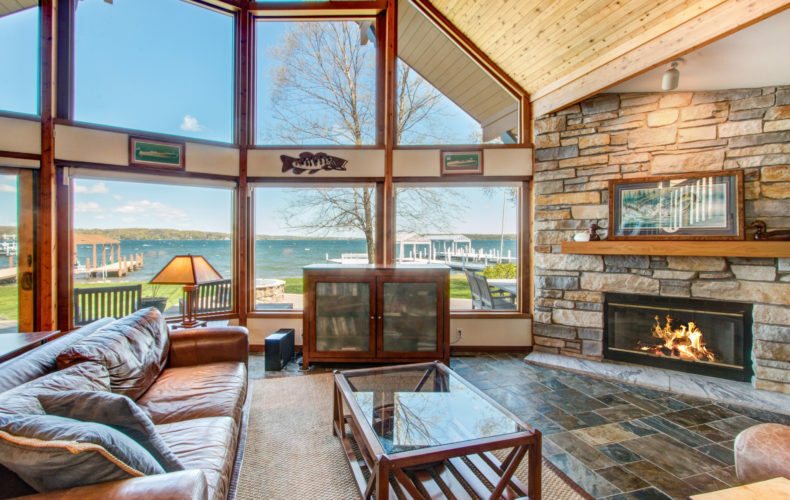 This is what a Lake Geneva lake house will offer you. If you’re only interested in a lake house that offers you a great view and nothing else, you might as well just move to Evanston. If you went to the Next Door Pub and the Next Door Pub was in Walworth, but instead of being in a restaurant space the restaurant is in the Ben Franklin space, then you’d start to understand. 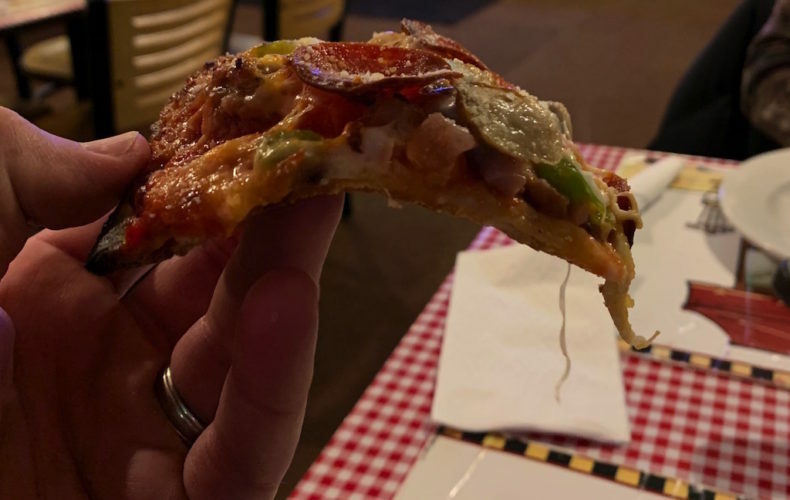 If the pizza that you ordered at that restaurant in the Ben Franklin building was similar to the Lake Geneva restaurant pizza, except that the pizza was just flat out better, then you’d realize that you’re not in the Next Door Pub at all. You’re at Pino’s. And the pizza tastes good. The night was full of confusion. I had intended to take my family with for pizza, and we had intended to go somewhere in Lake Geneva. Maybe Oakfire, maybe not. But the dog’s grooming appointment ran late due to matting and shaving, so we were left with little time between the grooming and the 7 pm Faith Christian basketball game. 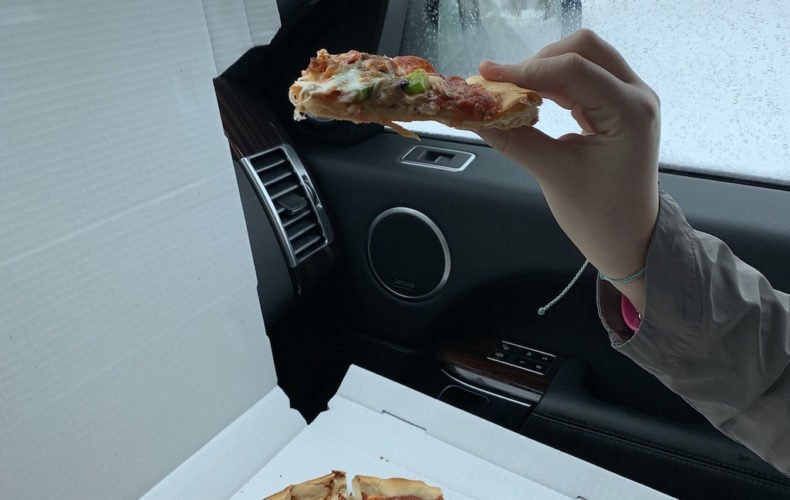 With that little time there was no Lake Geneva drive in the forecast, so we settled into a Walworth routine and pulled up to Pino’s at 6:15 pm. If you’ll recall the fish fry review, Pino’s is in Walworth at the back of the strip mall that houses a library, a Chinese restaurant, a gym, a general contractor’s office, and a medical clinic. If you were looking for a theme here, there isn’t one. The Pino’s building is far in the back, and it’s not a Pino’s building at all as much as it is a Ben Franklin building, assuming you were in the Walworth area in the late 1980s and maybe even the early 1990s. The building is large, so large that it lacks any particular charm. If you want atmosphere, go somewhere else. But we’re not looking for atmosphere, we’re looking for good pizza. When we were seated at 6:16, there were no other patrons in the dining room. Only a scant few contractor types sitting at the bar, no doubt considering, as was I, that they were sitting in the sewing section of Ben Franklin. The waitress was quickly table side and without delay we made our order. One large cheese pizza ($16.25) and one sort-of large (14″) Traditional pizza. Their traditional comes topped with onions, mushrooms, green peppers, sausage, pepperoni, ham, and olives in two tones, which we requested be mercifully left off of our pizza. The time was 6:19 pm. On the stereo, Tom Delong sang about his first date. At 6:29 pm, Weezer came on. It was apparent that the person making the music decisions was also nearly 41, and I wondered if they, too, thought it odd that our lives have brought us to this place. At 6:39, the pizza was served. 20 minutes is a nice amount of time to wait for a pizza. It isn’t so fast that it leaves you wondering just how the pizza could cook in that short amount of time, and it isn’t so long that you start to grow impatient. The pies were large, well cooked without being burnt, and looked exactly as a tavern style pizza should look. I’ve had this pizza before, but never under the guise of grading it for the world. This time, there was more on the line. The first slice made it obvious that we were dealing with a lot of cheese here. Loads of cheese. But this is Wisconsin, and a cheesy pizza is what the locals demand. The flop test, as evidenced above, was passed with ease. The crust was crispy, but it wasn’t cracker crispy. The crust is thin, technically, but not so thin that you could consider labeling it “thin crust” on a menu. There’s very little chew to the crust, and if you were on a search for the worlds best pizza crust you wouldn’t stop here. The vegetables and meat on the traditional were delicious, with properly softened vegetables blending nicely with the generous chunks of sausage and thin wafers of pepperoni. The sauce wasn’t too heavy, and down to the last bite the crust retained at least some crunch. This pizza dinner was a good one. Was it perfect? No. The scene has to account for something in this series, and the scene here is very, very basic. The service was polite and prompt, our water glasses refilled as needed. The pizza is, for this style of pizza, about as good as it gets. Was the Traditional a bit heavy on the toppings? Sure. Was the Cheese a bit heavy on the cheese? Yes. Would I have preferred a crust that was either thinner and crispier or one with more rise and chew? Of course. But on this cold February night, we were happy to eat a properly prepared tavern style pizza, albeit in the woven basket section of the Ben Franklin. It’s over. That’s it. There’s nothing left. We made it. No more winter, not here, anyway. Sure, up north there’s still winter, but there’s winter there in the spring and there’s winter there in the fall. Winter is what they do. Winter and bugs. But that’s not how it is here, no sir. Here, winter is done and spring is next. I’m happy to have arrived here, in spring. Ah, but you say it’s still winter. You say it’s three degrees outside today. You say the wind blew at 50 miles per hour yesterday and last night, and cars wrecked and houses shook. You’re right about those things, they did happen, and they are happening, but what does that have to do with spring? The forecast, you tell me, and you point to your phone, to the icons and the numbers. It’ll be cold all week, you insist. Snowy, too! Yes, but how much longer can that cold last, now that it’s spring? If it’s spring, I’ll give you your cold temperatures, but there’s no staying power, not now. Days, sure. Weeks, maybe. But months? Years? There’s hardly anything to worry about here in this late winter that’s really my spring. You should see things like I do. The ice! You insist, albeit in vain. Yes, I know there’s ice. Lots of it. My driveway is impassable, my yard a slick, thick sheet of frozen snow and frozen rain, the lake, deep and dark and thick with ice. I get it. I do. That doesn’t really have anything to do with spring, and you’re right. That’s why I know they’re not long for this place, at this time. 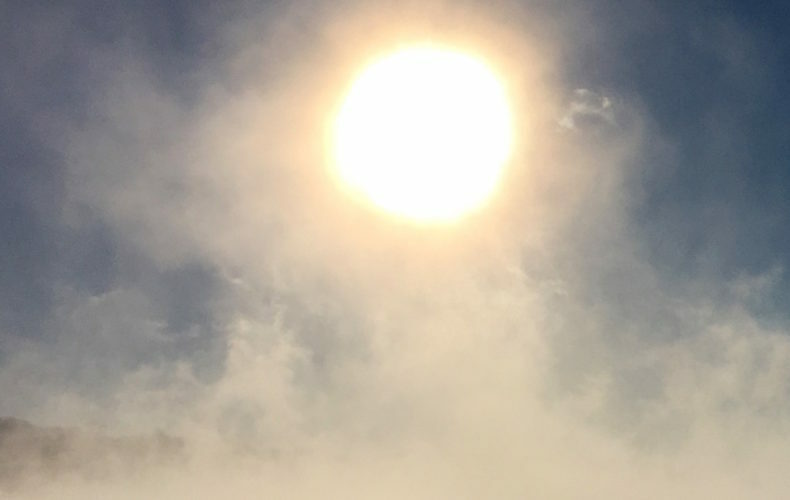 How much ice can last through spring, which it now is? With so much spring around us, who can even see the ice? Still you think I jest. Still you think I’m wrong. Still you sit in your house with the furnace churning and your hands warmed by your coffee and you shutter to think of so much more winter. You’re forgiven for being wrong, but you’re still wrong. 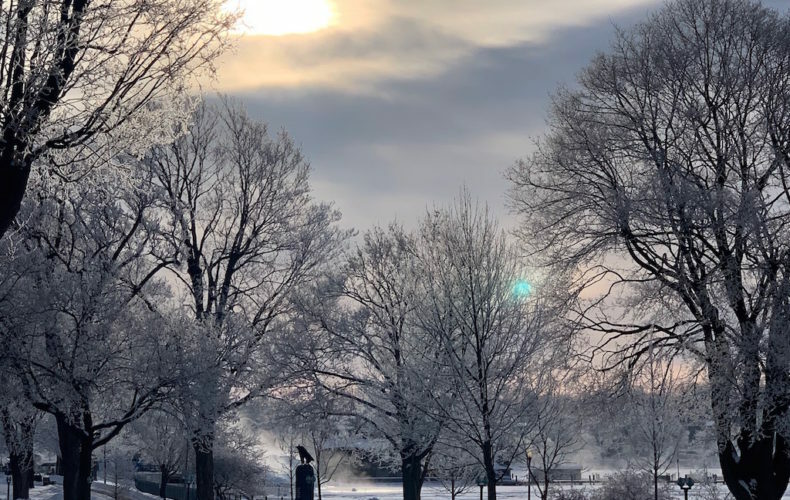 In the same way that summer is over once you start thinking about fall, once you start wishing for denim and boots and apples and leaves, it is also the case for winter. Once I’m done with the snow and the ice, which I have now decided I am, there can be no more winter with my mind set forward to spring. Get ready for it, because it’s coming and it’s coming soon, though I admit my definition of soon may be different than yours. More than fifty years ago, in a suburb of Chicago, a member of the Rosati family opened a pizzeria. Years later, a franchise model was born, and Rosati’s Pizza expanded throughout Illinois, the Midwest, and beyond. Today, there are nearly 200 Rosati’s locations. But that doesn’t concern me, because I didn’t even want to eat lunch at Rosati’s yesterday. Oak Fire was my aim, but Oak Fire’s website said they were open, their menu placard outside the restaurant said they were open, the guy inside walking around seemed to indicate that they might be open, but the door was locked. Improvise, adapt, overcome. I thought of two or three other pizza places after Oak Fire and before Rosati’s, but those places would only open later in the day for dinner service. Pizza, it seems, is seen as a dinner item, which is silly. With the history of my day in place and the history of Rosati’s understood, I pulled into the parking lot and met a friend for lunch. I had never darkened the door of Rosati’s. Not this one, not any one. The Lake Geneva location is adjacent the Sherwin Williams paint store, just a bit West of the Highway 120/50 intersection, behind the Taco Bell. The location is not ideal, but it works. The interior of the restaurant is decorated like the basement rec room of a Schaumburg tudor in 1996. Chicago Bears and Bulls memorabilia, along with a few token Packers pieces covered the walls. A life size cutout of Michael Jordan and another of a younger Brett Favre kept watch over the dining room. Don’t confuse Rosati’s with a normal sit-down establishment. This is a fast food restaurant. The tables are covered in wood grain formica. The chairs are the sort you’d stack tall after a church service. There’s nothing here memorable, nothing that sets any sort of mood. This is a place for eating. At 12:30 pm on a Tuesday there were a scant few tables occupied when I walked up to the counter to place my order. The large cheese pizza was 16 inches, the same size as the large at The Next Door Pub. The menu said the pizza was $16.99. The special, scribbled on a dry-erase board near the entrance, said that a Tuesday large cheese + 1 topping pizza was just $13.99. Their version of “supreme” is called Super Supreme and features opinions, peppers, mushrooms, sausage, pepperoni, and black olives. I ordered the pizza half cheese, half super supreme, minus the black olives because those are disgusting no matter what anyone says. The order-taker struggled with my order. The way I saw it, she had a few different options for my bill. She could consider my order as the cheese special at $13.99 and add on a fee for the half that was super supreme. Or she could charge me $16.99 and add a charge for the super supreme half. Or she could charge me for the super supreme, and that would be that. The latter option seemed the wrong one, but that’s what she chose. I paid $21.49 for a Super Supreme that was half cheese. I was wounded. But I paid the tab, tipped her for her self-inflicted trouble, and sat down at a table near Brett Favre. It was 12:36. Then I waited. And waited. And waited. I thought the wait was too long, especially for a chain restaurant that should, at this late date in their business history, have the art of quick pizza making well refined. I also thought of how I received the Next Door Pub pizza quickly, and that turned out to be fatal speed, so I waited. Thirty minutes after I ordered, the pizza was brought to the table. It was large, greasy, well browned, and cut tavern style. It looked pretty good. And it was pretty good. The sauce wasn’t super sweet but it had nice flavor, the cheese was ample and spotted with browning from the hot oven, the crust crunchy, at least at first. The crust was thin, but it wasn’t particularly good. There was a school cafeteria vibe with the crust. It didn’t flop as terribly as the Next Door Pub rare crust, but that’s a low hurdle to clear. Toppings were applied with a heavy hand, and the cheese was thick, but not so much that it was a burden. It was good because I was hungry, but was it something unique, something worthy of praise? No, it wasn’t. Still, we ate the pizza and were satisfied. Will I go to Rosati’s again for pizza? No, I won’t. The pizza was fine. But we’re not trying to find fine. We do fine really well here. We’re looking for outstanding. Rare. We’re searching for a winner, and in a crowd full of pizza, Rosati’s doesn’t deserve any special consideration. On December 17th, I decided to try the Keto diet. The timing was complicated, so close to Christmas, a holiday revered in my family for its significance, yes, but also for the candies, the breads, the pies. In spite of the temptations, I adhered closely to this diet. No sugar, no bread, no starch. Fruits aren’t even safe on this diet, and so I steered clear. I was proud of myself for enduring the way I did, steadfastly from that day in December right up until a day during the last week of January when I realized that I am nothing if I not a bread eater. If I can’t eat bread, what’s the point of this so called life? I like pizza. Quite a lot, but maybe not more than the average American, or European. I find it to be a comforting old friend, a safe menu choice, a small pie making for a simple appetizer, or a large pie feeding a family of four for $20 or so. Even when my wife and I traveled through France last spring, we often found our meal of choice in the shape of a circle. 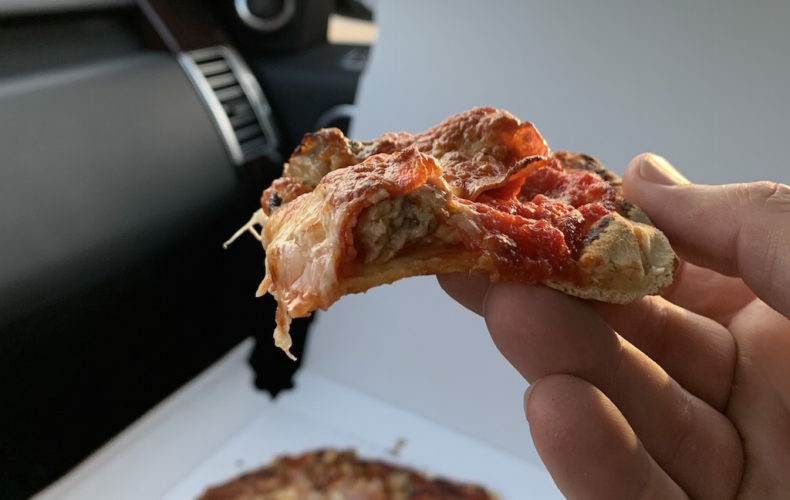 It wasn’t only difficult for me to avoid pizza during the six weeks I toiled under the meaty thumb of Keto, it felt wrong. My mother made pizza on Saturdays. A homemade crust, thick and doughy, sauce, and toppings that generally steered clear of anything exotic. Sausage and pepperoni ruled. Later in my life, I had a wood fired pizza oven built at my house so I could experiment with my own pizza making, the results of which varied wildly from pizza to pizza. Later, I built a fly fishing cabin, and added a wood fired oven to that home as well. My pizza making skills evolved, but consistency still haunts me, even to this day. Earlier this week, I posted a picture of a floppy slice of pizza on my Facebook page. It was a woeful slice, indeed. I announced the beginnings of a pizza review series, and the response was enthusiastic. In fact, when my wife logs into my account to tell the world that I’ve died, fewer comments will be left. Some warned me against local pizza. Go to New York or Chicago for pizza, they said. This place is the best, some wrote. Try this place, order the pizza well done, someone suggested. 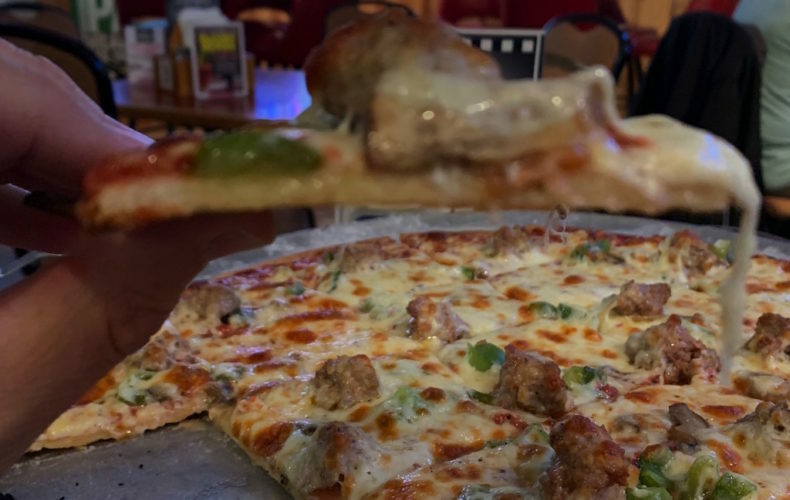 Pizza, while not a particular strong suite of the Lake Geneva area, is something that matters. In preparation of my review series, I decided on the process. I will order one large pizza, half cheese and half supreme (or whatever the establishment calls their pizza with some vegetables and sausage). There’s a popular website where the founder travels from town to town reviewing pizza. “One bite, everybody knows the rules”. This is what the man says before taking his bite. I know this concept to be preposterous. 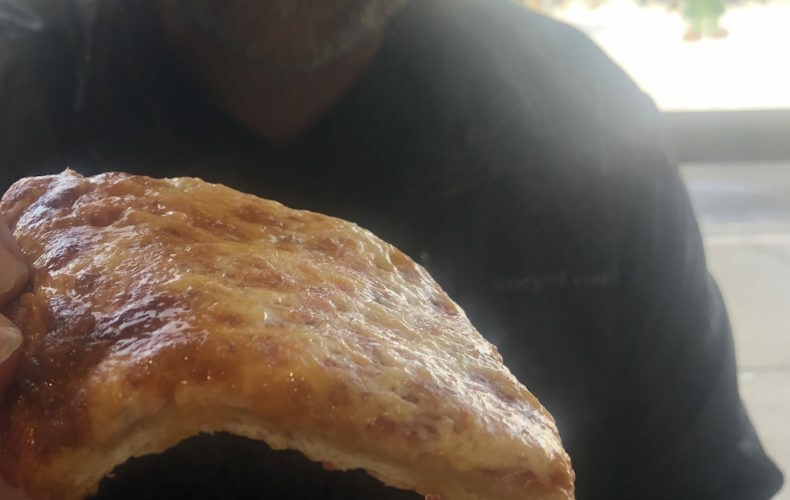 One bite does not tell the tale of a pizza. What if I’m exceptionally hungry that day, and that first bite is amazing not because of the pizza, but because of my near starvation? What if the first bite is good, but the next thirty-four are mediocre? This will not be a one bite review, this will be a pizza review. I’m not a coward, so I’ll eat the whole stinkin’ pizza. How else can a dish be judged? That brings us to my first google search. “Best Pizza in Lake Geneva”. This is what I typed into my browser. Tripadviser, Yelp and others told me there was a consistent opinion in our market. The Next Door Pub received top placement on many sites, often followed or proceeded by Oak Fire. With the reviews of the people considered, I made my first decision. It was a snow day, and I was hungry, so at 5 pm sharp my son and I walked into The Next Door Pub. This establishment on the north side of Lake Geneva is one that I know well. I’ve eaten the pizza perhaps a dozen times before, which doesn’t make me a regular by any stretch. The space is quite basic, nothing fancy. A couple of dining rooms and a bar. It’s modest. But at 5 pm on Tuesday night the place was hopping. The clientele was diverse: construction workers, families, retirees and at least one young couple on a date at the corner table, awkwardly sharing an order of wings. My son and I were seated at a four top near the front door, and then we waited. And waited. And waited. Ten minutes later, a waitress made her way to the table and took our order. One large pizza, half cheese, the other half being their “famous garbage pizza”, that of onions, sausage, green pepper and mushrooms. We sat and listened to the conversations of the surrounding tables. No one had anything interesting to say. Ten minutes later, the pizza arrived. It felt like it came out a bit too soon. We had waited more than ten minutes for our waters, and expected to wait another 15 or more for the pizza. But ten minutes later, there it was. A large pizza, half cheese and half garbage, cut tavern style. That style, by the way, is the common style for pizza in the Lake Geneva market. It’s a reasonably thin crust pizza with ample toppings, cut in squares, not slices. This pizza looked fine, but the cheese on top was quite white. There was no evidence of browning, no bits of char. The speed at which the pizza was brought to the table and the lack of browning on the cheese was worrisome, but I’ve had this pizza before and figured it would still be tasty, even if it didn’t look tasty. But it wasn’t. The crust was limp, as evidenced in that damning photo above. It was soft, soggy, undercooked. When I mentioned this initially on Facebook someone said that I have to order the pizza “well done”. This is silly, and akin to ordering a Coke and asking the waiter to make sure it’s fizzy. The crust was soft and too thick to be considered proper tavern style, the sauce was a touch sweet, which I actually prefer. The cheese overwhelmed the pie, which is a condition that used to plague my mother’s pizza as well, though she never opened a restaurant. The sausage was fine, not too loaded with fennel seed, which is a vile seed that should never again be planted. 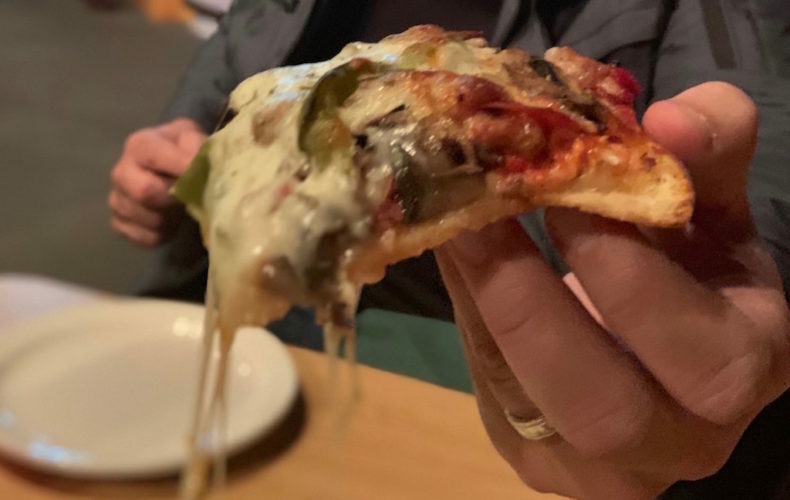 The vegetables were adequate, not too crunchy, but here they are placed under the cheese and stacked high, which means great care must be made to pull a square of pizza from the plate and not have all of the toppings slide onto the table. Making matters worse, the crust couldn’t even support itself, so this pizza was less a pizza and more a soft, messy casserole. I recognize people love The Next Door Pub. It’s a fine pub, and I’m sure many people count it as their favorite. But I’m not many people, and I have no allegiance to this, or any other restaurant in the area. I’m just hoping to eat some good pizza, and on this night, I struck out. This is the time of year when social media feeds are filled to the brim with mockery. Mockery of our place, of this place, of the cold. The snowbirds are on beaches, toasting to sunsets. Karen guessed the exact time the sun set and she won a free T-Shirt!! They offer up lip service to their northern friends. Stay Warm! They say, with their feet in the sand. Another Boring Sunset! They write, implying that it isn’t boring at all. Why Do I Live Here? Asks someone who hasn’t yet won the ability to spend their winter someplace else. Me? I was driving home last night in a snow squall, the wind whipping across the road, drifts creeping towards the center line. I drove in my car, my steering wheel and seat warm, my four wheel drive confident. There was no crisis here. I pulled into my driveway and into my garage. I walked into my house and lit a fire. The night would be easy now. The cold outside of no concern. The scenery and the excitement of severe weather both to my liking. What’s so bad about winter? I suppose there are ways that it’s bad. If you park your car outside your primary home at night, every night, that might be pretty difficult. I remember the days of scraping windshields and dead morning batteries, and those times were indeed more difficult than these times. In the same way, if you live in the north and you lack a fireplace, this would make winter far less appealing. Why would you invite this condition upon yourself? We all make mistakes that we have to live with, but no fireplace in Wisconsin? Really? Remedy this, and you’ll be closer to enjoying the nights when the temperatures plummet and the snow whips. But this isn’t about why winter is fine. This isn’t about stew and fires and warm hats. This is about you, and your vacation home, and how you can enjoy winter without stressing about your vacation home. I’ve mentioned these things before, but they bear repeating on a morning such as this. Lest you think I’m lecturing without practicing, I have a small cabin 160 miles away from here. I don’t go there super often. But today, with temperatures well below zero, I know my little cabin is just fine. Because of technology. Cheap technology. I have a single camera in the house, and a single thermostat. Both connected to a single app on my phone. This technology could have been set up by my 12 year old daughter. The total cost of this futuristic set up was around $350. With this set up in mind, I can look at a live feed of my little cabin living room and know that the temperature outside is -11, but the temperature inside is 63. This is the lesson. Times were, vacation homes were drained of water, covered in plastic, and turned off. This would happen in October, and the old cabins would sit, freezing and dry, until the following April, or May. That was nice back then, but this is now. 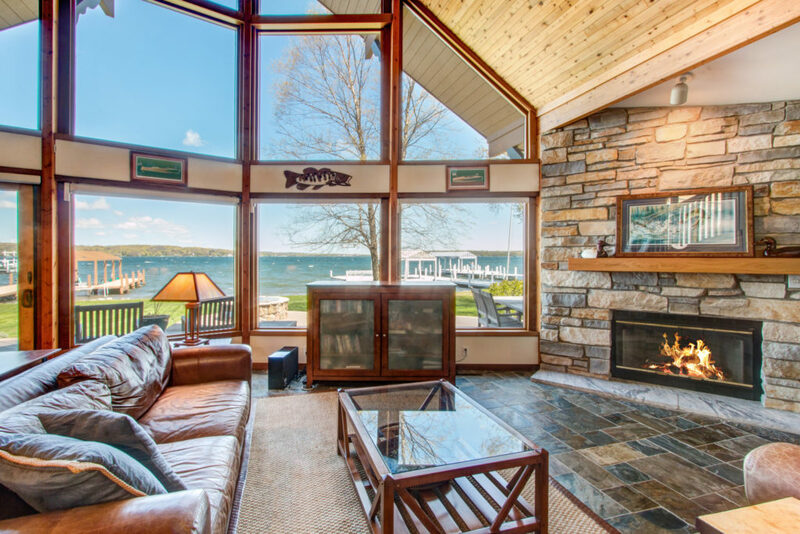 There’s no reason to own a Lake Geneva vacation home if you’re not going to visit between October and May. 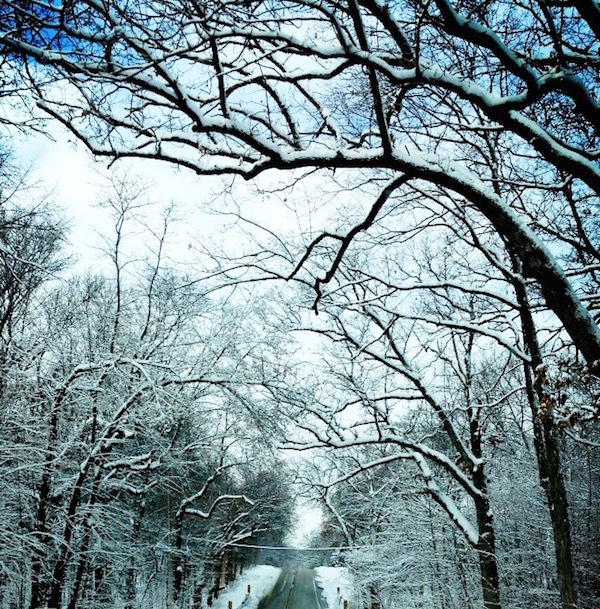 The days of seasonal ownership are long over, as owners have realized that winter here is enjoyable in its own way. But even if we’re not going to visit in the winter, we should take care of our houses. The first step? Temperature. Tempting as it might be to turn the heat down to 52, because you want to save the planet and conserve energy, don’t do it. Just don’t. Leave your heat at 63 degrees or more. Why would you turn the heat lower than that? To save $50 a month for a couple of months? Don’t be silly. Leave your heat at 63 (install a wifi thermostat so you can monitor it), and don’t go about the business of draining your water lines with the assistance of a plumber. Just do as I do and turn off your well pump and water heater (don’t do this is you have a whole house humidifier, or consult your plumber), or turn off the municipal water supply inside your crawl/basement. You do this in case the furnace blinks out, and in doing so you’ll make certain that you won’t have a houseful of water a day or two later. It’s easy and smart. About that camera. Why wouldn’t you do that? It’s so easy, and you needn’t hire an IT firm to set it up. It can be as simple as a single camera that will alert you to motion or sound. Can it nab an intruder for you, too? No, but I find that just a little peace of mind is better than none at all. In fact, I’d trade no peace of mind for a little every time. Between the camera and the thermostat, I don’t really see what else you’ll need aside from a local emergency contact if indeed something goes awry. Next time you’re tempted to lock your vacation home down tight and give it up for the off-season, rethink your mistake. Keep the heat up, turn the water off. Check in once a day with your app. And if you do come up for the weekend, be sure to have some firewood. Make that fire. Enjoy that house. And remember, it could be worse, your life could have been reduced to watching a sunset and hoping the waitress calls your name. I’m not sure why you’re spending the time to read this. It’s coming. Can’t you see? It’s not far away now. Last night, it wasn’t even close. No one cared about it, then. Cars drove and people walked, stores sold goods and life was as normal as ever. Then it wasn’t. Things changed when the thing found its way onto the radar, close now. Nebraska, then Iowa. Soon enough, the state line. Cars are driving faster now. Gas stations rationing gas. Five Gallons Per, the sign reads. Women are nervous and in the distance, the sound of a man, gently weeping behind his garage, where his children cannot see his tears. Emails to check this morning. Trying so hard to find a distraction from the thing. Maybe this email will say something about anything else. Something about the shutdown, about the wall, something about Nancy Pelosi on the tarmac. But no such luck, the topic is consuming. News organizations, once enemies battling for clicks and subscribers, united in this front. United in their warning. A modern day electronic air raid siren. MAJOR STORM COMING. Nothing else matters. And yet there you are, reading this, wasting time when there’s so little left. We might get snow tonight, so much that it’ll stick to the ground and stick to your boots. If you’re out in it, there’s a chance some of it sticks to your hair, or your hat, if you’re lucky enough to have one. You’re going to need it. It isn’t just all this snow, so much of it that it might rise to the top of your ankle if you’re short, it’s the wind, too. A mighty wind, some would say, maybe the greatest wind ever. Coming off that giant lake, blowing hard, making it difficult to stand. The snow traps your feet, the wind pushes you over. This is how it’s going to happen, the weathermen have foreseen it. Be safe, dear friends. Cling tight to your loved ones, to your life. The snow is coming, and it isn’t just any snow. It’s a Major Snow. If you don’t believe me, check your email. There are few market segments that I find as curious as Geneva National. Under no other particular context does one association make up its own market segment, but here we are, knocking at these gates. The fact that this large association functions as its own market is something that vexes those who live and play there. 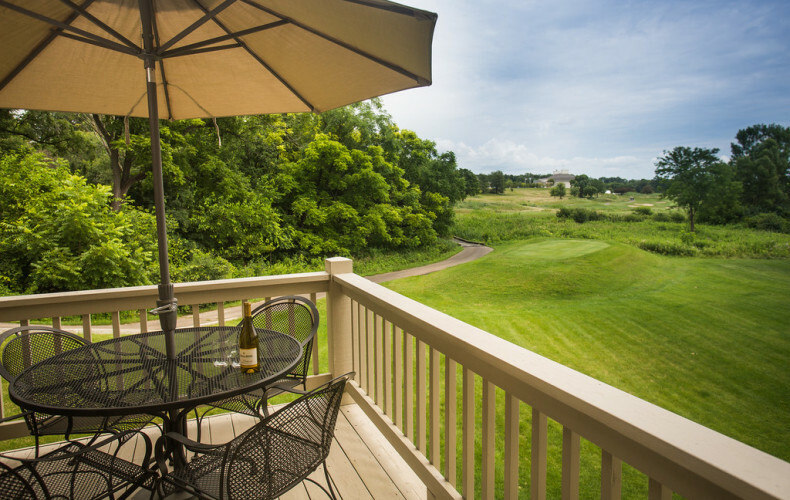 Why can’t a buyer just be on the hunt for a Lake Geneva area condominium priced under $500k? Why must a buyer seek out Geneva National specifically if they wish to buy one of those condominiums? Why does a homebuyer who purchases a vinyl corn-field tudor for $500k neglect to first consider his options inside Geneva National? Does that buyer know that Geneva National is nicer, and objectively better? For the year just ended there were 81 total MLS sales. Those sales ranged from small condominiums priced under $100k, to beautiful newer homes priced over $1MM (two sold over $1MM last year). As we sit just inside the parameters of 2019, there are only 36 available homes and condominiums (ten more properties are under contract), including two properties listed incorrectly in the MLS as single family homes (these are technically all condominiums). The fact that an agent listed two homes as single family might be a sloppy mistake, or it might just drive home the point I made in the opening paragraph. If you want to sell Geneva National’s single family homes, are you better off pretending they’re not inside Geneva National? I think the answer is no. Or at least it should be no. Geneva National is back, and it really is better than ever. Sure, there are still homeowners residing inside these brick and cedar behemoths that were built prior to 2006, those with dated finishes that the owners don’t think are dated. Sure, there are still lots that can be bought for the price of a high mileage used Corolla. But the market has mended, and the volume from 2018 is a sure sign that things are back to stable. While I enjoy seeing lots of sub-$200k volume, the true measure of Geneva National is in how it deals with its expensive inventory. Continued high volume years would be nice, but that’s not necessary to continue the momentum that GN has successfully built over recent years. Over the last six years, Geneva National has averaged 2 sales over $700k each year. 2017 printed just one sale at that level. 2018 closed four sales over $700k, and that might be as good of a sign as any for this embattled association. 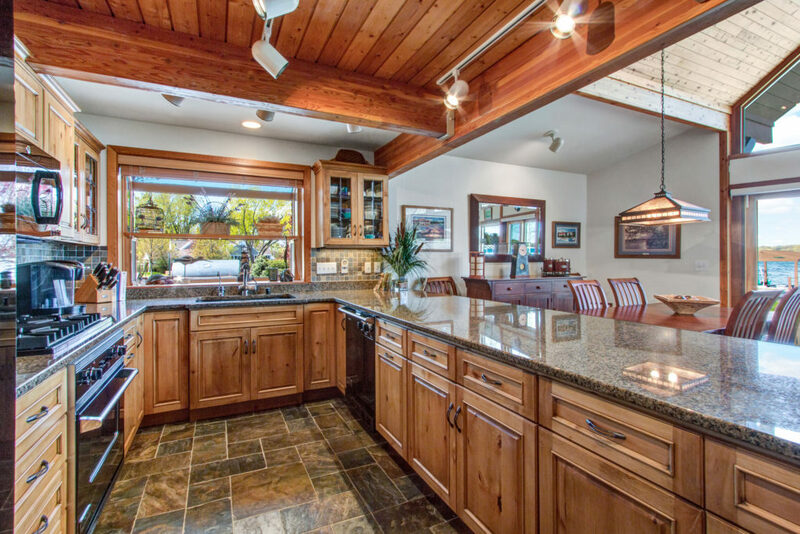 Sell the higher end inventory and you’ll give buyers confidence to move up in price. You’ll give vacant land buyers confidence that their new build makes some market sense. And you’ll give current owners confidence to update those awful 2003 bathrooms. Broad market activity is terrific, but the real positive out of Geneva National in 2018 was an increase in upper bracket liquidity. To understand how far Geneva National has come, you need only look back to 2012. That year was likely the bottom of the last market cycle, and during that dark year Geneva National closed just 35 single family and condominium properties. For each of the last two years, GN has closed over 80 such properties. Current inventory is low, but there are several high dollar properties on the market today that will test the continued momentum of this large association. Will buyers at the high end appreciate the country club atmosphere, complete with new pools and tennis, to such a degree that they’ll provide liquidity over $1MM? 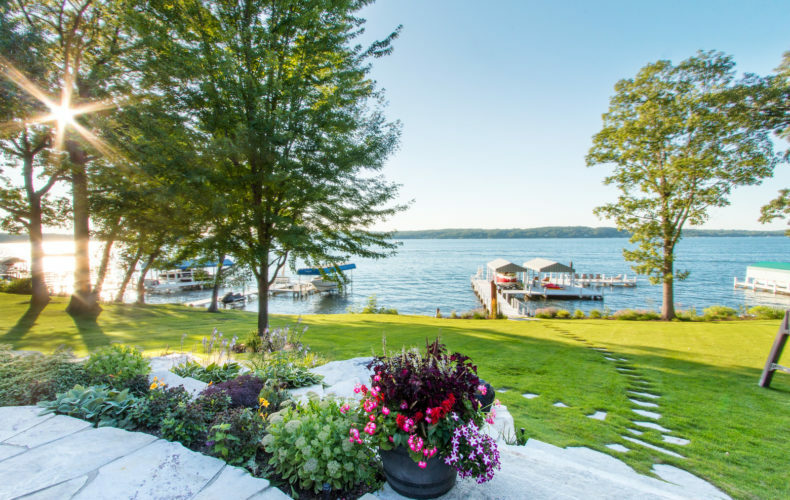 Or will those higher value buyers continue to opt for the lakeside lifestyle that the Lake Geneva lakefront and lake access market provides? Only time will tell, but if I was a betting man, I wouldn’t bet against Geneva National in 2019. We know the trend. It’s not just here, but it sure is pronounced here. It’s not just a trend on Geneva, it’s a trend on our other, secondary lakes as well. Construction. It’s everywhere you look. Delavan is full of construction, Lauderdale, too. Heck, even Lake Como has a strong movement of new construction. Gentrification, is good, everyone except the hipsters say. Out with the old and in with the new, this is our progress. This is what we were made for. To improve, to manipulate, to grow. Geneva is certainly taking that mantra to heart, and we’ve been building and building, and in fact, we just might build until we can build no more. I left my office this week in the rain and drove around the lake. Down the roads that lead to nowhere, around the corners where the summer lives. 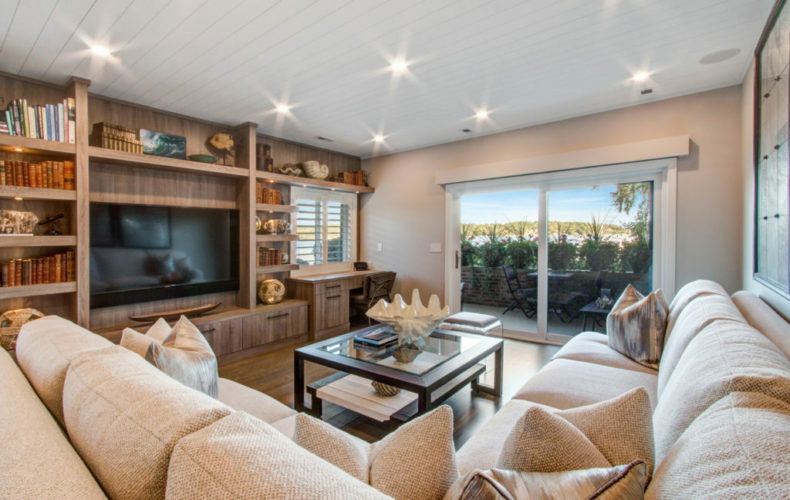 In Williams Bay, there’s a large scale lakefront remodel that’s been in process for well over a year, and there are two spec homes that have recently been completed. Further south, there’s a rumored new project underway, that where two lakefront homes will replace one lakefront home. More on this trend later, but overall it’s a negative trend for our lake. If you care about this scene, fight against density. In the Elgin Club, there’s a new build that’s just about done. There’s one nice sign in the Elgin Club- a neighbor purchased a home and knocked it down, perhaps to create a peaceful side yard. That’s the sort of trend I wholeheartedly endorse, and I do hope that more lakefront owners take advantage of purchasing neighboring properties when they come to market. Fewer homes, that’s what we need. In Geneva Bay Estates there’s a new foundation where a modest ranch once grew. There’s a patch of dirt in Geneva Manor where a home recently stood. That wasn’t a lakefront home, but it was sort of like lakefront, so it matters. $900k or so for a tear down here isn’t something I’d sign up for, perhaps chiefly because of the tax bill that the City Of Lake Geneva likes to gift to new owners. Speaking of, did you know that the combined Stone Manor tax bill for the majority owner there is now nearly $300k? And the city hassles over permit applications, for shame. Around that corner of the lake there’s a new build just finished on LaGrange, and a new complicated build underway on Marianne Terrace. That’s a project led by Lowell Management, and that’s a good thing. 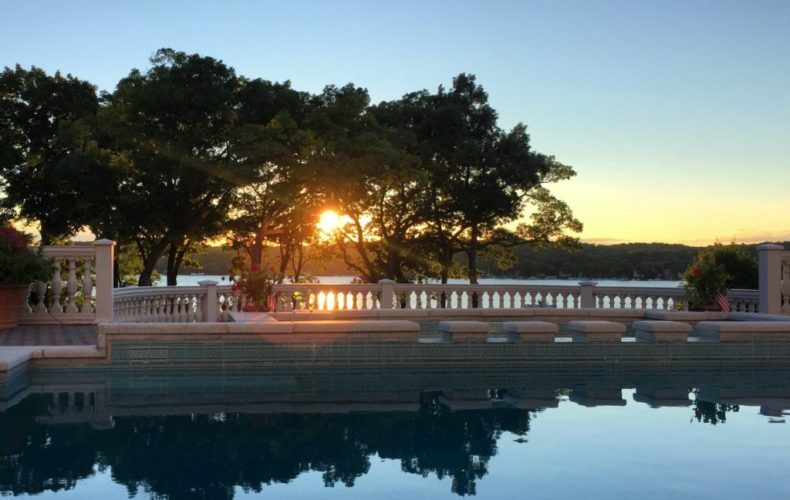 This site is unique, more like Malibu than Lake Geneva, and I have no doubt that the finished product will be beautiful and well executed. The lakefront in Loramoor is humming along, looking sharp as it has since it first rose from that dirt (that I sold) in late 2017. At the bottom of Sidney Smith, there’s still the home that’s been under construction for years, looking, well, still unfinished. On Maple Lane, two new homes were just built, and there’s a new spec home taking shape there along that stretch. Those are easy, deep, 100′ level lots, so it makes sense (in one way) why people are drawn to that spot on the water. In Fontana, there’s a new build on the hill above the lake, but it isn’t lakefront, so it shouldn’t count. No matter, you’ll still see it from your boat this coming summer. The lakefront has plenty of new construction, this you can see. But I’m not thrilled with much of it. There are large, awkward houses being planted on lots that just can’t support that sort of heft. We don’t have any architectural approval committee for the lakefront, and in some ways, that’s a positive. But in other ways, it sure would be nice to have a panel to look over these builds before they rise. I dislike the trend of splitting lots, perhaps unless those lots are at least 200′ in width. The issue I have is when smaller lots are created out of old plat standards. The houses that tend to be built on the smaller lots rarely fit the neighborhoods. They aren’t cottages. They’re monstrosities looking to maximize living space and minimize neighborhood charm. Even so, Lake Geneva is continually improving itself, and one day, we’ll look around and have nothing left to improve. If you’re a fan of this lake and wish for it to remain intact long after we’re all gone, you have but one aim. Root for less density. Root for fewer associations. Fight against keyhole developments (much like the one proposed for Basswood last year). It’s easier to knock down charm and replace it with mass efficiency, but is that what’s best? I don’t think so. The year just ended was, by most accounts, a good year. But that’s a silly way to describe something as diverse and unique as a year. That’s like booking a table at Alinea and after four hours and 20 courses you take to your social media account to describe the meal as “good”. That wouldn’t happen, and that’s just a meal. How much more deserving of proper critique and detail is an entire year of our lives? Now that I’ve built this thing up, let’s dumb it back down and talk about the lakefront market in 2018. The year? It was pretty good. We started 2018 with light inventory, just ten lakefront homes were available at the onset of 2018, and that limited inventory forced me to worry about what the year was going to look like. I knew there were buyers, plenty. I knew we had pending sales to give us a nice start to the new year. And I knew the stock market looked stable on the heals of a Federal tax cut. But what I didn’t know was how much more inventory we’d add, and how firm the buyer’s resilience would be if we didn’t add enough inventory. That’s what matters, after all. The buyers. See, a Lake Geneva lakefront buyer is generally only a Lake Geneva lakefront buyer. But that motivated dedication only lasts for so long. If you have a buyer and they can’t find what they’re looking for, they’ll wait, for a while. They’ll come up to look at a lame new listing, and then they’ll come up again to look at another lame new listing. 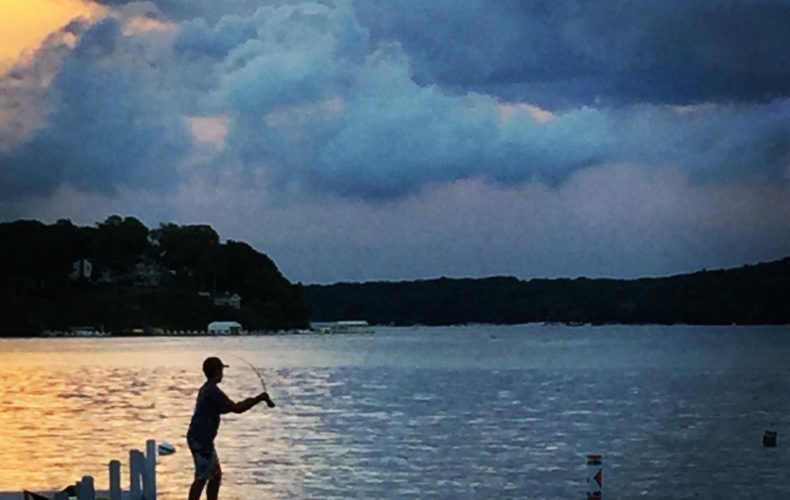 They’ll stay engaged, because the lakefront life is the life they want to live. But after time, that passion erodes into frustration, and frustrated buyers have a tendency to wander. Why spend so much effort waiting for a perfect lakefront on Geneva when Michigan has a whole state full of average vacation homes? I know, and you know, and that buyer used to know, that a Lake Geneva lakefront is not like any other lakefront. But desperate times call for desperate measures, and I worried that the desperation of 2018 would lead some buyers astray, and no doubt it did. But the year just ended with 23 lakefront sales (24 with the vacant lot included), including two in the South Shore Club and one in Buena Vista (technically not private frontage). That number is down from the 2017 total, but considering the limited inventory, that number is a terrific total. In all, we printed 2536 feet of lakefront shoreline, up from the 2017 total, but less than the 2016 total of 2882. That includes one lakefront vacant lot on the North Shore. We sold just over two million square feet of lakefront land mass, and more than 115,000 square feet worth of living space. 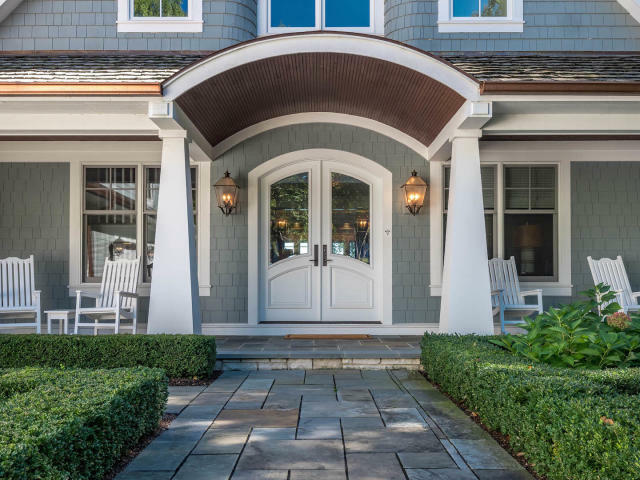 Prices ranged from $11,250,000 for a North Shore estate, to just over $1.1MM for a Walworth Avenue cottage. For my involvement, I ended 2018 as the number one individual agent in Walworth County yet again (per MLS), with more than $35,000,000 in closed transactions, so that’s nice. The lakefront loves its price per foot (PPF) measurement, that is, the total value of lakefront sales divided by the total amount of lakefront feet sold, this we all know. You should also know that I don’t love this measurement, as it really only seems to apply to lakefront homes in the 100′ range. 200′ lakefront lots experience compression of the number, in the same way that lots under 100′ tend to overachieve. We ended 2016 with a PPF of $27,193. We ended 2017 at $27,578. And after the activity and bustle of 2018, we finished the year at $27,684. For the buyers who think this market has spiraled upward and out of control, consider those numbers. Does that seem like unsustainable, unwarranted price growth? For 2018, we’re going to look a bit deeper at the numbers. We know our market was skewed by the $11,250,000 lakefront sale, that of 415 feet of frontage and almost 20 acres. We had an average number of entry level lakefront sales last year, closing four lakefronts under $1.7MM. The remainder of the lakefronts fell into somewhat familiar price categories. Let’s throw out our outliers at the high and low of the market, and pull our 2018 numbers from the remainder of the lakefront transactions. With that in mind, our PPF figure for 2018 actually goes up, to $27,994. If you look at the purest way to measure the accuracy of that number, you needn’t look further than the 100′ vacant lot that sold on North Shore Drive last summer. That 100′ sold for $2,750,000. That’s easy justification of the average. 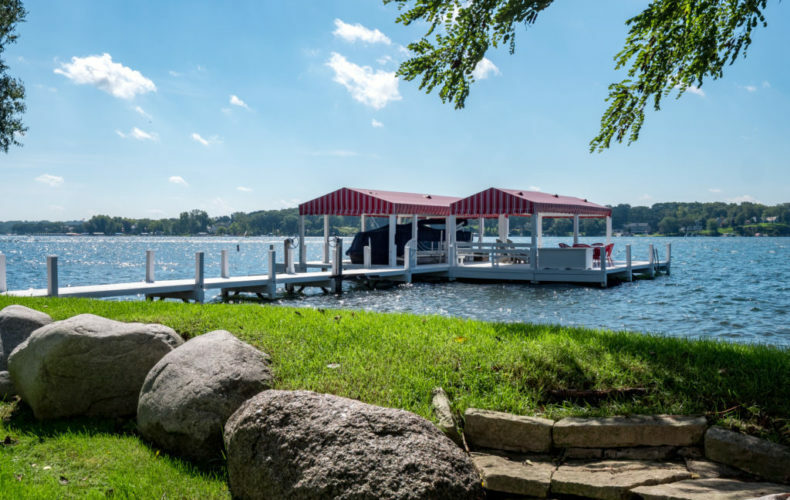 But there’s more to the lakefront than a basic price per foot tally, there’s also the average price per square foot of the structures themselves, as well as the price per square foot of total land mass. For these two figures, we’re going to keep with our habit of throwing out the high and low 2018 outliers, as well as the South Shore Club sales and the Buena Vista sale, as these are not true lakefront sales (even though the market treats them as though they are). 2017 registered an average housing price per square foot of $560. 2018 pushed that average up to $625. For the overall land mass statistic, we had a 2017 average of $58.09, whereas 2018 just printed a $51.66 average. Does that mean the value of lakefront land actually decreased in 2018? Of course not. None of these metrics individually tell the story, which is why to judge the performance of our lakefront market you need to figure and consider all of them. 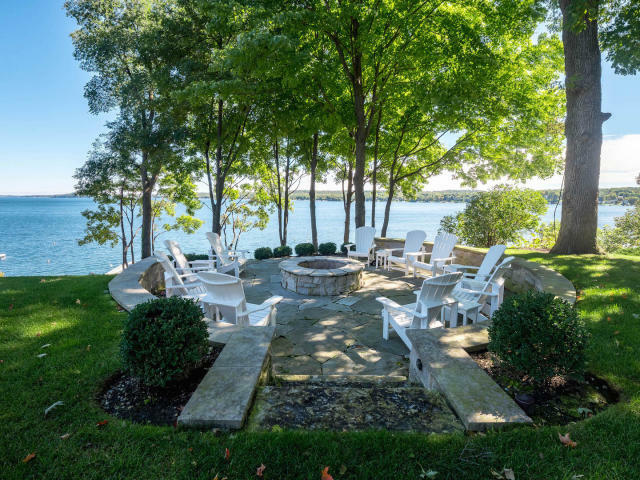 Today, there are just nine lakefront homes for sale on Geneva. If you remove the Fontana home that has shared frontage and a shared pier, and you remove the Trinke property that has a lagoon between the home and the lake, then you’re stuck with just seven true lakefront homes on the market. Of those, the least expensive is listed over three million dollars. Not cool if you’re a buyer. But if you’re a buyer, I have some good news for you in 2019. The recent tumult of the stock market is a difficult situation for the lakefront market. Rising interest rates don’t bother us very much, but a decline in invested assets does. 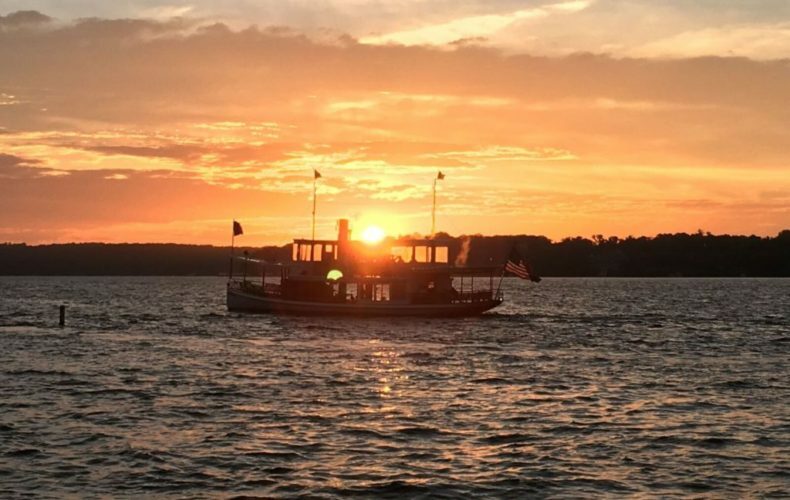 With this in mind, our stable of confident lakefront owners will find a few who dislike what they see, and those few might offer up some inventory that will appeal to the 2019 buyers. To be certain, there are plenty of buyers still. The low inventory of 2018 didn’t scare away everyone, though I’m sure there’s some guy sitting at his Michigan vacation home this morning what it is that he’s done. Pray for this man, and his family. I’m anticipating inventory will increase in January, and you’ll see reduced prices in a few of the 2018 carry-overs. Most sellers don’t care if the market slows, but again, if you’re a buyer, you’re not concerned about most sellers. You’re concerned only about the position of the seller who owns the home you’d like to buy. 2019 is going to provide inventory, and for the buyers who have been waiting, the question will be how the seller prices line up with buyer expectations. I think buyers will be a bit more shrewd in this new year than they were last year, but I have a bold prediction to make: 2019 is going to be just fine. We’re going to sell lakefront homes. The market is going to provide inventory. We’re going to end 2019 somewhat flat in terms of valuations and volume, but flat is just fine with me. Flat, in fact, is good. The stock market is going to either go up or go down, but one thing will remain. People want something more. They want a place that means something to them, and to their families. They want to enjoy their wealth. We can’t buy more time, and while I’m also sad that my Apple stock has cratered, that isn’t going to keep me from wanting to enjoy my family and enjoy this place. And I’m betting I’m not alone, because what you see below isn’t something you can replicate in the city or the suburbs.